With just a few items from the craft store you can transfer photos onto canvas yourself! I was looking on the internet a few weeks ago for Valentine's Day crafts and I came upon several listings from Martha Stewart. 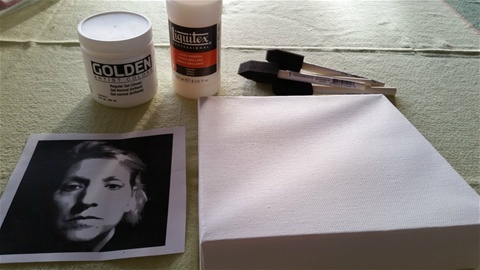 Most crafts on Pinterest or in magazines are for children, so I was excited to find this photo transfer project that looked like something an adult would actually make. Brush a thin layer of gel medium on the top of the photocopy with the foam brush. Lay the photo face-down onto the wood or canvas and smooth out any air bubbles with the back of a spoon. Let dry for at least 8 hours. Next, soak the photo by pressing a very wet rag on the top of the photo, making sure the image is completely soaked. Use your fingers to carefully rub off the paper fibers. Work slowly and don't be afraid to rub until all of the paper is off. This may take several minutes and when it has dried the image might look cloudy. Don't worry if the edges look a bit torn or if some of the image comes off - it adds to the look. Once you have dried this completely, brush on a layer of the clear sealer to protect the picture and to make it shine.